One of the primary applications of unmanned aerial vehicles is surveillance. A low altitude surveillance aircraft allows the use of light sensor payloads in a small airframe. This reduces operational cost. As surveillance often needs to be conducted covertly, the capability of silent flight enables the use of low altitude aircraft. Electric propulsion systems operate significantly more silent than combustion engines. Due to the low specific energy of batteries they are limited in performance and endurance. Hybrid-electric propulsion systems combine the advantages of both systems by enabling a high performance and long endurance aircraft to fly electrically and thus more silently. Existing methods for the design of aircraft with hybrid-electric propulsion system do not satisfy the three basic requirements for preliminary design methods: accuracy, high computational efficiency and generic applicability. Therefore, the first objective of this study is to introduce a method for the design of small unmanned hybrid-electric aircraft that does comply with the demands. The method’s core is a propulsion system design procedure. It is embedded in an aircraft design scaling process. The integrated propulsion system component models ensure accuracy by the use of power state variables. In addition, the method makes use of surrogate models with emphasis on a computationally efficient formulation for the propulsion components. This means that regression functions are preferred over interpolation. The surrogate models are formulated continuous and the underlying databases cover the complete requirement space. This contributes to their generality. A full factorial optimization scheme is applied to the propulsion system design procedure. 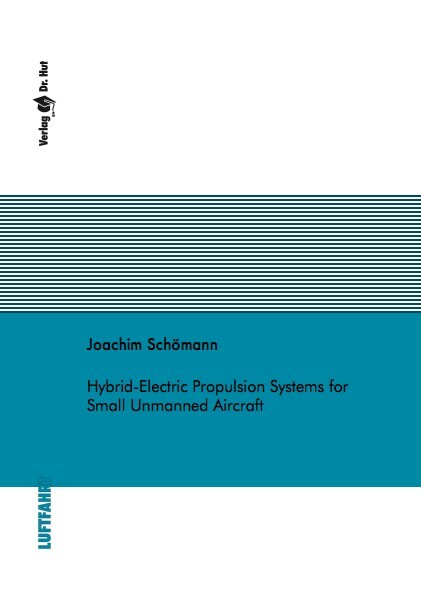 The second objective of this study is the analysis of hybrid-electric propulsion systems. The identification of basic characteristics can be used for the reasonable consideration of hybrid-electric aircraft in the design process. For short flight times, hybrid-electric offer advantages in fuel and energy consumption due to the more efficient use of the internal combustion engine and its shorter use. The higher efficiency is caused by the combined use of engine and electric motor at maximum power demand and the resulting better balanced torque demand between the flight phases. For longer flight times the increased takeoff mass and the resulting power demand outbalance the efficiency advantages of hybrid-electric aircraft.